The quokka, Setonix brachyurus, is a small marsupial about the size of a large cat. Like other animals in the macropod family, such as kangaroos and wallabies, the quokka eats grass and small plants, and is mainly nocturnal. It lives on some small islands off the coast of Western Australia, mainly on Rottnest Island near Perth, and Bald Island near Albany. A small number live on the main land in the protected area of Two Peoples Bay, which they share with Gilbert's Potoroo. The quokka is the only member of the genus Setonix. The quokka weighs between 2.5 kg (6 lb) and 5 kg (11 lb). It is around 50 cm (20 in) long with a 30 cm (12 in) tail. This is short for a macropod. It has a solid build, rounded ears, and a short, broad head. It looks like a very small, fat kangaroo, but it can climb small trees and shrubs. It has rough fur which is a brown colour, fading to pale brown underneath. The quokka eats a small amount of its waste products. It is about the size of a domestic cat. The quokka is a social animal and lives in large groups. They eat grass, sedges, succulents and leaves. They can become very sick if fed with things like bread, given to them by visitors to Rottnest Island. Visitors are now told not to feed them. Quokkas breed at any time on the mainland, but in late summer on Rottnest. The female quokka has two babies (called joeys) in a year. The quokka moves in the same way as a kangaroo, using both small and large hops. Quokkas are not scared of people, so you are able to get quite close to them, particularly on Rottnest Island. It is against the law on Rottnest Island to handle or touch the animals in any way. 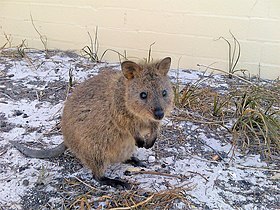 A A$100 fine can be given by the Rottnest Island Authority for picking up a quokka. People can even be taken to court and get a fine of up to $1000. These fines have been used in some unusual cases where quokka have been hurt or killed by visitors to Rottnest. There are a lot of quokkas living on the small offshore islands, because this is only a small area they are listed as vulnerable. On the mainland, they are attacked by dingoes, as well as introduced animals like foxes, dogs and cats. They also need thick ground cover for shelter. Farming has cleared much of the land which is another reason the species is threatened. The quokka was one of the first Australian mammals seen by Europens. The Dutch sailor, Samuel Volckertzoon wrote about seeing a "a wild cat" on Rottnest Island in 1658. In 1696, Willem de Vlamingh thought they were rats and named the island "Rottenest", Dutch for "rat nest". The word quokka is comes from a Nyungar word, which was probably gwaga. 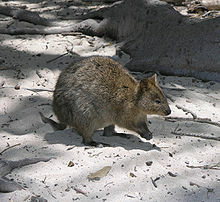 Wikimedia Commons has media related to Quokka.